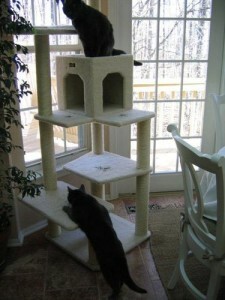 The Armarkat B6802 is a five tiered cat tree which stands at 5 feet 6 inches tall, that’s 68 inches high. It is also perfect for multicat families. The B6802 has 2 perches above the cozy condo for your kitty to snuggle in, and a further three tiers/levels below for him to climb upon. 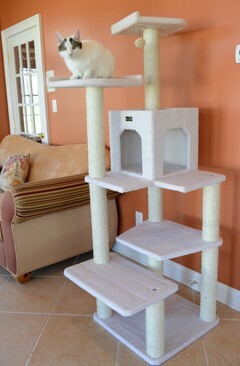 The condo, which is on the third tier, the two perches and levels are covered in a soft ivory colored faux fleece. Each of the cat scratching posts are made from attractive pressed wood and then wrapped in sisal rope which is perfect for vertical scratching cats. The B6802 provides a great way to increase the amount of vertical space in your home for your cats. If you have just the one kitty, he will have more than enough physical territory to himself. However, if you have 2 or more cats, the B6802 will allow them to be close to one another whilst still maintaining their own pecking order. The posts on this Armarkat B6802 68-inch cat tree are made out of pressed wood and are covered in sisal rope. The 5 rest level areas are also made out of pressed wood and are covered in a beautiful soft ivory coloured faux fleece material. The house/condo on the third tier is also covered in soft faux fleece. Our research shows that over 80% of reviewers who bought the B6802 thought that it was a good cat tree. It does what it says on the box, and if you have a kitten, or a small to medium sized kitty, then you’ll be more than happy with it. Is the Armarkat B6802 Okay For Clawless Cats? If you have clawless cats and are wondering whether this Armarkat cat tree will be suitable for them, they will probably be just fine, according to several cat owners. According to several Armarkat B6802 cat tree owners, if your cat doesn’t have his/her front claws or any claws at all, they should still find this cat tree easy to navigate because the platforms are spaced well for jumping. Apart from felines who have physical limitations or are aging, adventurous and daring cats shouldn’t have any problem jumping from one tier to another. Plus, they can still use the posts to vertically stretch upon. Overall, the B6802 should be a good purchase for the price. So long as you know what to expect and what you’ll have to do to maintain it, there is every chance that you’ll be pleased with your purchase. There were 877 Amazon.com customer reviews at the time of writing this article. The 4 and 5 star reviews added up to 815 positive customer reviews and the 1, 2 and 3 star customer reviews added up to 62 negative customer reviews, giving this particular Armarkat cat tree an overall rating of 4.6 out of 5 stars. However, you still need to pay attention to the 62 negative customer reviews. The main complaints were that the Armarkat B6802 may be ‘sturdy’ but it wasn’t ‘solid’ enough because as their kitties were running and leaping boisterously onto this cat tree, they thought that it wobbled just a little too much for their liking. The toys that came with this Armarkat cat tree didn’t last very long. Several customers agreed that this particular piece of Armarkat cat furniture is more suited towards kittens and young or smaller cats because their larger cats (17lbs +) couldn’t fit into the condo. There were a few customers who really didn’t like the faux fleece covering and thought that the whole tree wasn’t the quality that they had expected and commented that it wasn’t worth the money. There were many other customers who commented that their kitties didn’t seem to mind the slight wobble. Regarding the toys that came with this item, many customers said that because they had read the reviews before purchasing the Armarkat B6802, they knew what to expect and so decided to buy some new, good quality toys and hung those on the tree instead. Many of the 4 and 5 customer reviews also commented that they had cats that weighed on average 11-15lbs, and they didn’t have any problems getting from one level to the next. As for the negative reviews about the faux fleece, it’s all about personal preference really. If you think that your cat would prefer carpet, there are many cat trees on the market with a combination of carpet and sisal rope. However, in this case, it would seem that the majority of customers seemed to like the faux fleece and so did their cats. Should You Buy the Armarkat B6802 ? For the price range that it’s in, the Armarkat B6802 seems to be good value for money, however, it really depends on what you’re looking for and what you’ll be willing accept from a cat tree before you part with your hard earned cash. 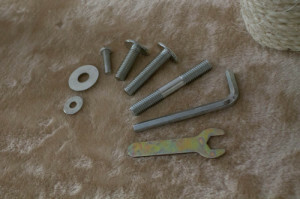 Firstly, when you’re putting the tree together, make sure that you tighten every screw securely and remember to check and tighten them periodically, maybe every few weeks or so. Also, if you have a small to medium sized kitty who loves to climb, claw and scratch at your furniture, they’ll love the sisal rope posts. And if kitty doesn’t mind a little movement from the tree when he/she leaps at it with great speed, which most cats won’t, then this will be a good purchase for you. There are better quality pieces of cat furniture on the market and they will cost more, but then they’ll be a lot more solid as well. Also, if you have a particularly large cat, then you may be better off with a cat tree specifically made with larger cats in mind. From a cat’s point of view, they have vertical access via an item of furniture where they can sleep, run and jump on, scratch and claw at to their hearts content and not get into any trouble from their humans. From a humans’ point of view, we get satisfaction in seeing our kitties happy and playing with their new toy. In summary, a very high majority of Armarkat B6802 cat tree owners, 815 out of 877 customers to be exact, have stated that it was a very good purchase for them. They are extremely happy with the value and quality of the workmanship they got for their money, in this affordable price range, and their kitties love it too.